In South Africa the cantaloupe is unknown by its given name. Here we call the cantaloupe either sweet melon or spanspek. Mention the name cantaloupe and very few people will know what you are talking about. The cantaloupe or spanspek is a member of the Cucurbitaceae family which includes other veggies and fruits such as squash, melons, gourds, cucumber, pumpkins, luffas and watermelons. The Cucurbitaceae family was predominantly distributed around the tropics, where those with edible fruits were amongst the earliest cultivated plants in both the Old and New Worlds. These days they can be found all over the world. So how did the Cantaloupe get the name Spanspek ? Way back in 1847 when Sir Harry Smith was governor of the Cape he and his wife used to eat breakfast together. Harry used to eat bacon and eggs while his spanish wife Juana used to eat cantaloupes (melons). The kitchen staff gave Juana's breakfast a name and called the melons her spanish bacon. Translated into Dutch or Afrikaans the name would be “spaans spek” (spanish bacon). 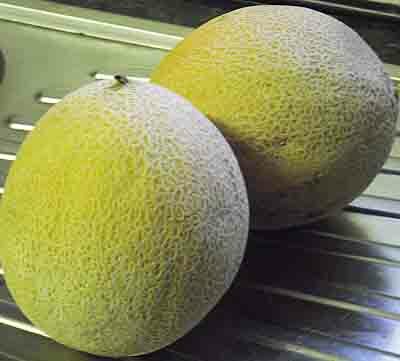 This name has stuck and cantaloupes are known as “spanspek” all over South Africa. As spanspek is a very tasty melon everyone loves them. The good thing about spanspek is that they are easy to grow. The spanspek or sweet melon needs a bit of space as it sends out runners like the watermelon or the pumpkin. Fortunately it does not need as much space as the pumpkin so it can be grown in a small garden. A second good trait of the spanspek is that it can be trained to grow on a frame or trellis. When growing on a frame or trellis the fruit need to be supported. If you have enough space in your garden you can allow the plant to spread on the ground. Spanspek grow quickly and take around three months to produce fruit. In South Africa you can start planting spanspek in early September and continue through to December. To have a continual crop of spanspek in your garden plant new seeds every three weeks after your first planting. As mentioned above you can sow your first seeds in early September. If you live in an area where frost is prevalent wait for the weather to warm up a bit before planting. Seeds can be planted in two ways,(in frosty places) into pots until the seedling has sprouted and has one fully formed leaf. It can then be transplanted into its final growing spot in your garden. If you live in a warmer climate where you can plant your seeds directly into the garden then do that instead of transplanting the seedlings. Spanspek like to grow in soil with lots of compost mixed in. Ensure that the soil you are using drains well. Before planting your seedlings or seeds add bone meal or super phosphate to your soil. Bone meal is the organic fertiliser but if you have dogs in your garden the chances are they will dig up your beds looking for the bone they think is buried there. In this case you should you super phosphates instead of bone meal. If you intend to train your spanspek plants to grow on a trellis then its a good idea to put the trellis in place before planting the seeds. Spanspek like full sun but also need to be protected from the wind so plant them somewhere in your garden where they get both. How to plant your seeds. Spanspek plants need about one square metre of space to grow in so when planting your seeds plant them or your seedlings between 50 and 60 centimetres apart. As with cucumbers and other members of the Cucurbitaceae family plant two or three seeds together in the same hole. This will prevent gaps in your garden if one seed does not sprout. If three seedlings germinate pull out the weaker plants and either plant them elsewhere or discard them. People with small gardens should only plant two or three plants. If you are planting seeds directly into the ground early in the season where frost occurs, the seeds should be planted at a depth of 15-20mm. Once the soil has warmed up you can plant them at a depth of about 25mm. Once your spanspek start sending out runners it is imperative that you immediately start training them to grow on your trellis work. Trying to bend a shoot once it has thickened up is likely to end up with the shoot breaking off as the thicker they become the more brittle they get. As the shoot grows upwards keep tying it on because if it is allowed to hang free it will definitely snap off in a wind. Once fruit starts to form it will be necessary to support them. Lift the fruit carefully into an old net bag, something like you get when you buy oranges and tie the handles of the bag to the trellis work. Don't make it too tight as the spanspek will need room to expand. If you don't have net bags use a bit of shade cloth which you can tie to your frame with cable ties to form a small hammock. This will allow the fruit to lie on the shade cloth and be able to get full sun to ripen. Do not forget to keep watering your plants especially when the plants are in flower. If the spanspek plant is allowed to dry out during this period the flowers will fall off and the plant won't bear fruit. When watering the spanspek plant try not to wet the leaves as this could cause the plant to get mildew. For plants that are growing along the ground it is a good idea to put a layer of mulch or compost around the plant before the leaves spread out too far as this will keep the fruit and leaves off the ground and dry after watering. Feed your spanspek plants with an organic 3.1.5 fertiliser or even a liquid fertiliser to enhance the quality of the fruit and flowers. Liquid fertilisers should not be applied to leaves but around the base of the plant. Mulch and feed your cantaloupe plants before they spread because handling the leaves could cause bruising. Try not to let more than one fruit form on a runner as this will improve the quality and size of the fruit especially if the plants are growing on the ground. If your spanspek are growing on a trellis then it might be a better idea to keep fruit smaller as their weight might cause them to break off the plant. To get the same volume of fruit allow more than one fruit to form on a vine. You should however experiment and see what works best for you. In humid conditions it is possible that mildew could appear on the leaves. To prevent this happening ensure that your plants are not too close together and that air can move between them. Remember not to wet the leaves when watering. Control mildew with a copper-based fungicide. A second problem you could experience is aphids. They will not affect growth but could be carriers of the mosaic virus. These viruses are plant viruses that cause the leaves of your plants to have a speckled appearance. Control aphids with an organic insecticide. Planting and growing spanspek is as simple as that!